Directed by Candy Bartoldus, Ph.D. Please join the GU Schola Cantorum at a Novus Ordo Latin Mass for the First Sunday after Easter (Quasimodo Sunday). 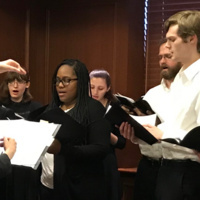 This academic year the Music Program offered instruction to students, staff, and faculty interested in learning Gregorian chant. We will sing all Propers and Ordinaries from the Quasimodo Sunday Mass. A handout will be provided so that the congregation can actively participate in singing the Ordinaries of the Mass (e.g., Kyrie, Gloria, Credo) and other chants (e.g., Vidi aquam, Victimae paschali, Ubi caritas, and Regina caeli). Sung in Latin with English translations and music provided. Readings in English.